When your baby is sick, keeping track of their temperature can be a time-consuming and worrying process. Let the FridaBaby FeverFrida thermometer take your worry away so both you and baby can get the sleep you need! 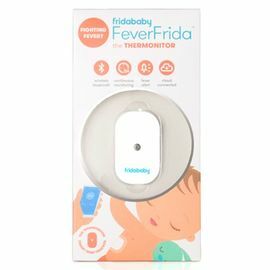 More than a thermometer, FeverFrida is a therMONITOR that transmits a temperature reading every four seconds to your Bluetooth enabled device via the downloadable app. FeverFrida attaches to the underarm using specialized hydrogel adhesive patches, and features alert functions for both fevers and medicine dosage timing. The FeverFrida cloud-based technology lets you monitor temperature readings wherever you are worldwide. Attach FeverFrida to companion adhesive strips before placing thermometer in underarm area. Temperature will be transmitted to your smart device via the downloadable app.